In their most recent show REvision, Edison Price Gallery invited ten artists from the NYC community to make work incorporating scraps and surplus material from the Edison Price Lighting factory that sits directly below the 2nd floor gallery. Sina Basila, Jane Dell, Larry Dell, Gene Lambert, Roya Farassat, Barbara Lubliner, Francis Milloy, Daniel Sinclair, A.V Ryan, and Anne Spurgeon all tackled the challenge. The resulting works took a wide array of shapes and forms, and the show was captivating between the rainbows, dramatic shadows, glittering metal, and glowing lights. Francis Milloy had several works in the show as well as a long-term installation of works in the stairwell. A Scottish-born lighting designer, Milloy’s arrangement and manipulation of material show expert consideration of light as a theme and tool. His series “Standard Unstoppages” is inspired by the Marcel Duchamp piece “3 Standard Stoppages,” in which Duchamp explored the manipulation of line by dropping three straight meter-long pieces of thread to the ground from above and documented the new curvatures. The Tate website quotes Duchamp as intending to “imprison and preserve forms obtained through chance” in this experiment. Likewise, the copper in “Standard Unstoppages” was also formed by chance when the artist found bent and broken copper pieces in the scrap bins of the factory. Milloy’s title, with its use of “Stoppages” (or “Unstoppages”) also references electrical circuits, which have no beginning or end; the shadow in Milloy’s work completes the circuit by mirroring each metallic shape. “Standard Unstoppages” similarly takes the seemingly random, angular shapes of bent copper rods and positions them on the wall so that the cast shadows become incorporated into the piece, creating a new, complex abstract visual. I really enjoyed the utilization of negative space and the sleek, almost futuristic, look of this piece. The copper rods used in this sculpture are electrical circuits taken from the factory that would have been used to conduct electricity in conventional lighting. Taking the theme of the show in a fascinatingly different direction, Sina Basila turned the scraps from the factory into fashion. Incorporating Edison Price’s prompt into her own practice, Basila used the metal leftovers for her series “Refashioned Garbage,” in which she mimics high fashion with wearable art made from “trash” and documents it through photography. After creating the outfits, Basila returned to the factory after hours to photograph herself in what felt like the natural setting for her newest creations. Sina Basila, for her series “Refashioned Garbage,” Inkjet Print. Through the manipulation of material, viewers can see the versatility of even objects intended to be disposable. For instance, in her photograph “Metal Pipes & Streamer,” many of the scraps she used required minimal alterations to become wearable. Segmented metal pipes and shavings already lent themselves to becoming accessories, and with a bit of staging and small adjustments the materials became a convincing steampunk aesthetic outfit. “Slices of Bubbles” (2015), by Carlos Inclan, the only permanent installation in the gallery, caught my eye because of a number of indoor rainbows it cast on the wall behind the tangle of optical fiber cables and recessed lighting. 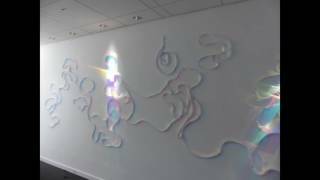 The wall-spanning piece plays on refraction, turning a tangle of white optical film fibers into a gorgeous, fluid rainbow. The recessed lighting (sourced from the factory) is on a timer to illuminate portions of the installation a little at a time, causing flowy, iridescent bursts of color to slowly appear and disappear on segments of the wall. Carlos Inclan, “Slices of Bubbles,” 2015, Detail of installation. Barbara Lubliner’s copper weavings bring forward a narrative of how gender plays into the arts. The artist has a history of making work relating to both femininity and recycling, and the pieces she created for REvision merge these conceptual interests. In the art world, where hard materials (wood, metal, plastic, etc) tend to be thought of as masculine while fiber arts and soft sculpture are perceived as feminine, Barbara Lubliner bring the two together, creating the woven tapestry “Red Sky” out of the same copper rods as Francis Milloy’s “Standard Unstoppages”. The meticulous weaving creates a beautifully varied surface that reflects the light from every angle. The piece brings up the question of what constitutes craft versus fine arts; metal and fibers both have dual utilitarian and artistic uses but one is more widely accepted as art (metal work), and the other (fibers) a hobby or craft. Barbara Lubliner, “Red Sky,” Copper weaving, 26” x 52”. Elsewhere in the show, Anne Spurgeon’s untitled sculptures are beautifully simple in the way they balance natural and manmade elements. Angular pieces of driftwood sport patches of textured aluminum shavings and rest on top of small concrete blocks. Spurgeon compares the stretches of aluminum shavings to lichen growing on a tree, and the dramatically positioned driftwood reminds me of a bonsai tree in both size and shape. Anne Spurgeon, “Untitled,” Wood, aluminum, and concrete, 8″ x 8″ x 17”. REvision is a solid group show that brings together the lighting design industry and the arts, two fields that work close together (think of the importance of track and other lighting to galleries and museums) but with one (lighting) generally seen as a tool and not a creative end in itself. The art in REvision highlights the versatility of metal as a medium and is truly a celebration of material and experimentation. For me, the most compelling aspect of this show is the major upcycling of industrial scraps -literally junk- into compelling, interesting art; it gives perspective on the perceived value of material and the worth of the disposable. Edison Price is a well known and established lighting manufacturer whose products are used in galleries and museums throughout New York and beyond. The company is over 60 years old, founded by visionary lighting designer Edison Price, but the gallery is a relatively new endeavor that works with local artists and invites them to make use of the factory below. REvision is up at Edison Price Lighting Gallery (4150 22nd St, Long Island City, NY 11101) until October. Gallery visits are appointment only, which can be arranged by emailing the gallery.